Junior Girl Scout Uniform. This uniform was made between 1973 and 1985 and was worn by girls in fourth through sixth grade. There are 5 pieces that could be mixed and matched: a blouse or green ribbed turtle neck, a jumper, pants and shorts. The jumper and blouse are shown here along with the official red tie, pins, sash and patrol leaders rope. The official hat continued to be a green beret. 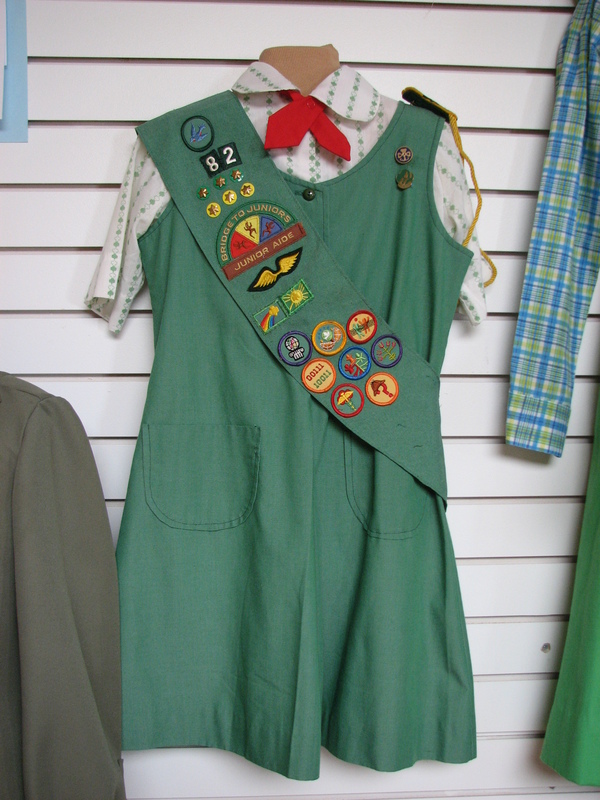 Insignia on the front of the sash include Brownie badges earned previously; Wings earned by “flying up” from Brownies to Girl Scouts, Sign of the Arrow and sign of the star earned by completing several requirements, which included 3 interest badges; and interest badges. This sash features the first computer badge. One of the requirements was to find 5 people who use computers! This entry was posted in Collection Notes, Museum updates and tagged 100th anniversary, 1970s, 1980s, Girl Scout, Girl Scout Uniforms, Glenwood Girl Scouts, Junior Girl Scouts, Pope County Museum, Vintage Girl Scout Uniform. Bookmark the permalink. I am sorry, but we cannot appraise items for value. A quick way to check what it would sell for is to look for similar items on e-bay.